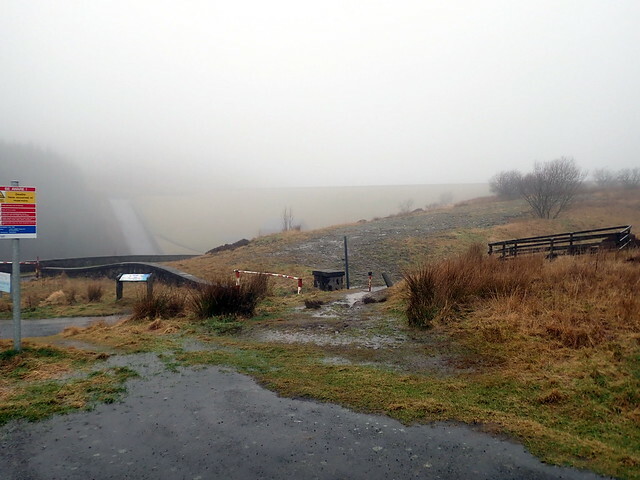 Leaving the car park - really inspires a good walk, weather of this sort! 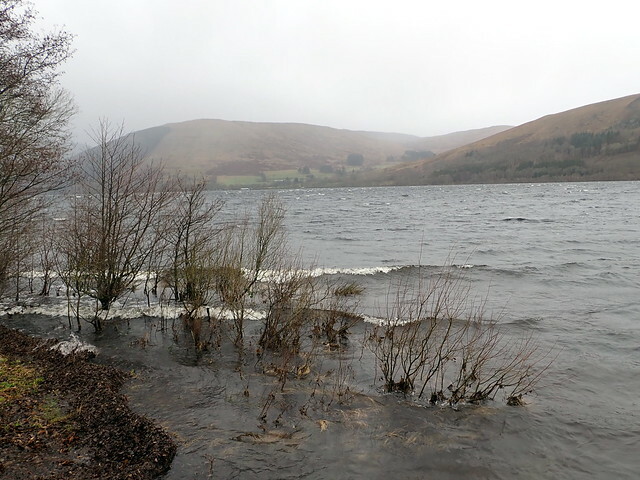 We walked along the reservoir path no further than the first stream, Allt Choinneachean which was in spate and not fordable without wading. 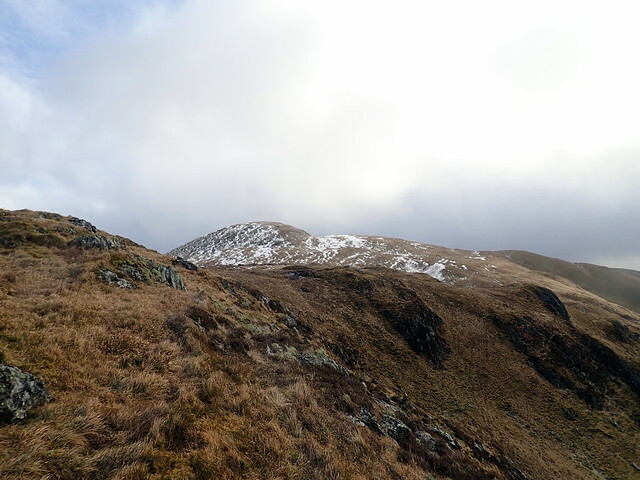 We ventured up the hillside to see if there was an easier place to get over, but without luck and ended up making for the track that rises to Choinneachean Hill. 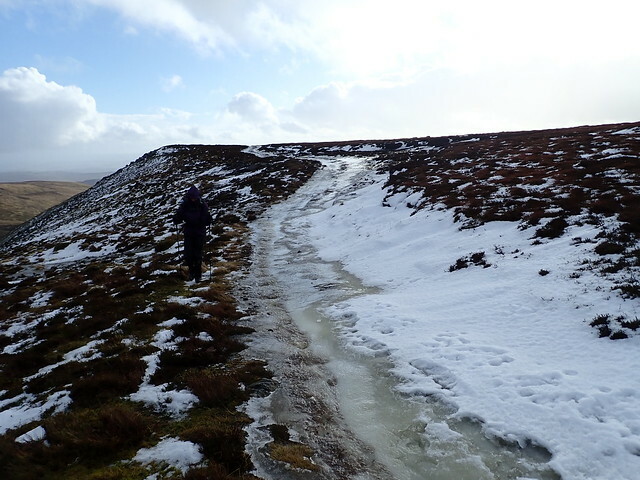 The track was thickly iced, with a river of fresh rainwater running over the ice. 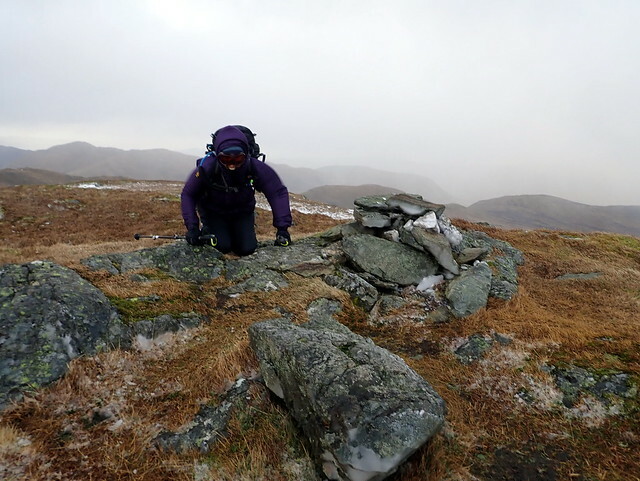 Plans to get the 2 Simms evaporated in the wind and rain - it would be enough to make the summit of Auchnafree. Which was easier said than done. We couldn't decide whether to follow the winding track or take a more direct line over the hillside - with poor visibility we ended up doing a bit of both. From nearly under my feet, a snow bunny shot and literally hared it down the path. I have never seen an animal move so quickly - possibly the ice underfoot aided its speed but boy - was like a white bullet. 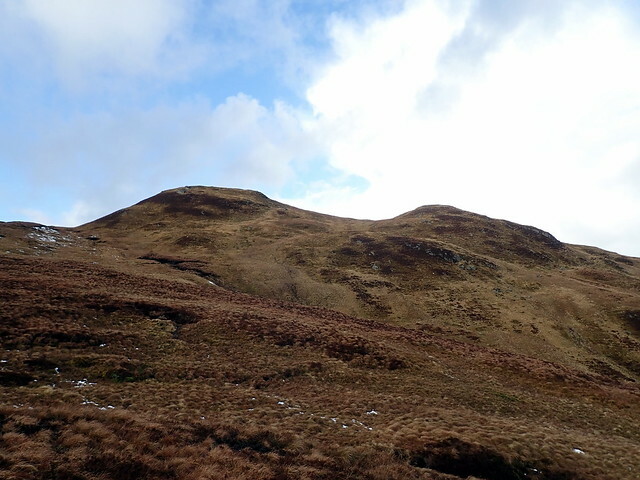 Eventually, much slower than the hare, we arrived at Gilbert's burn, disturbing some poor sheep that had sought what little shelter there was in the lee of the hillside, we ploughed up the hillside by the burn and onto the flat and very wet summit plateau. Heavy rain alternated with sleet, we were both soaked through and it was turning into one of the more miserable hill days I've experienced. 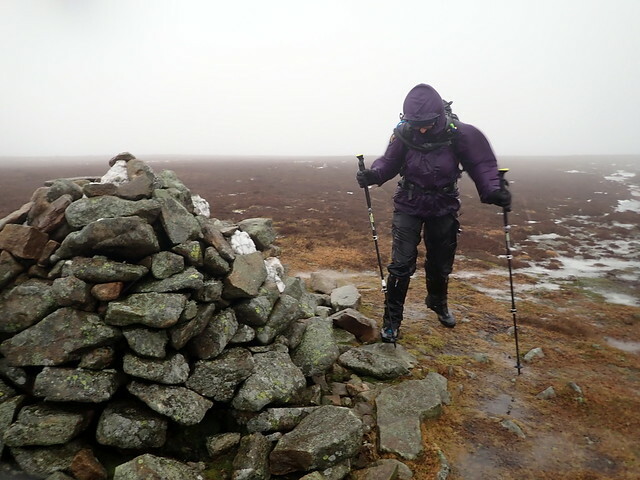 We got to the large cairn, reckoned that wasn't the tree summit, which we crossed over to then followed the track downhill - heading away from our starting point initially, but out of the worst of the weather by virtue of being lower down and definitely preferable to returning the way we'd come up. There were several gushing streams to ford along the track, but by that time wading wasn't a problem as we were already as wet as wet could be. After pouring ourselves into the car and wiping dry what we could we headed into Crieff for a few things, including getting measured for a (utility, non-wool) kilt for me - an unusual experience for the sales lady, I'm sure, measuring me up as I dripped onto the carpet. The walk up through the woods was alright, not too blowy. 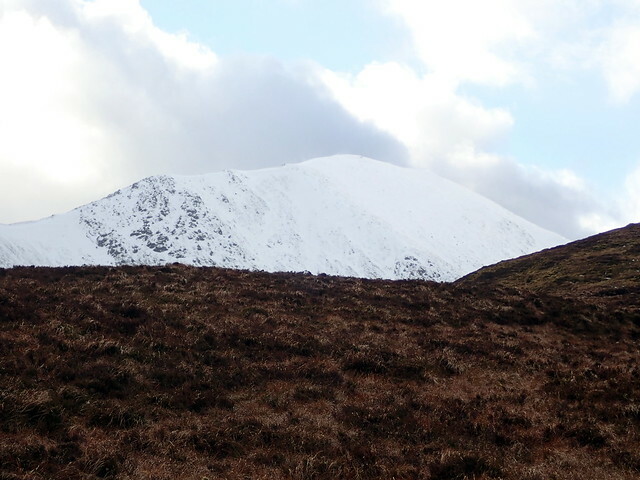 Vorlich had a fair amount of new snow plastered onto the eastern flank, but it seemed our wee hill was largely snow free today. Around this time my GPS decided to play up, losing signal and refusing to lock on - typically, today we'd managed to leave the map in the car. 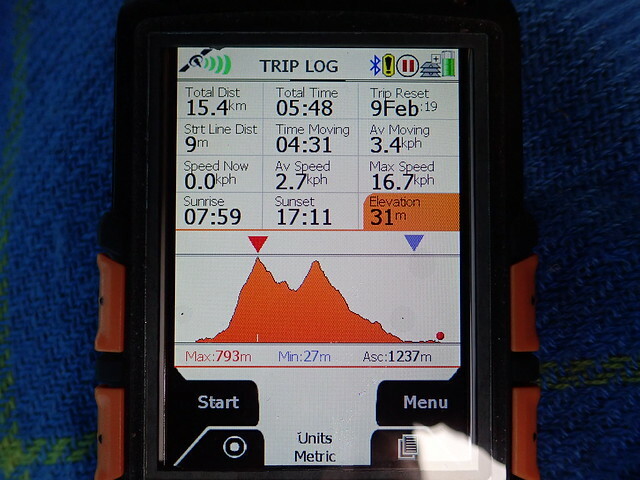 I was feeling very tired as we walked uphill, as though the full weight of 57 years had suddenly descended upon me. 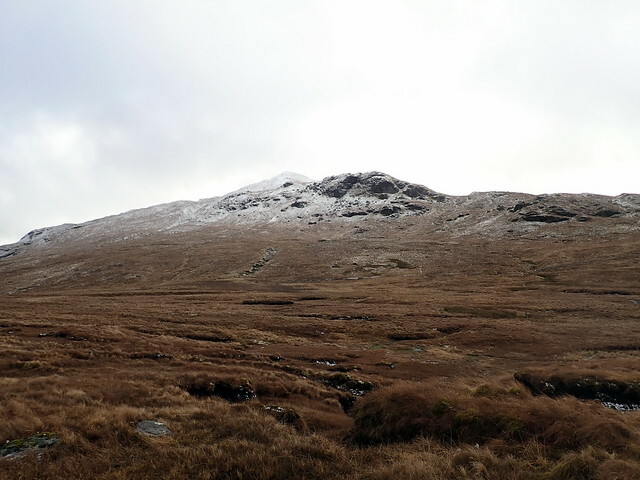 The path we'd been following seemed to peter out - I had a rough recollection from drawing the route where we were to go and we arduously gained height towards the west top of Meall na Fearna, where we paused for some much needed lunch and I managed to get the GPS to sort tiself out. I think it was huffing after all the rain yesterday. 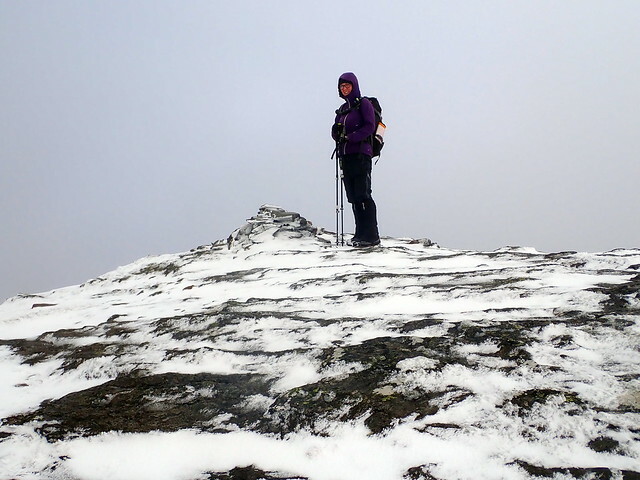 Position definitively established, we crossed over to Meall na Fearna, meeting the full force of the wind at the summit, where it was very difficult to stand upright. 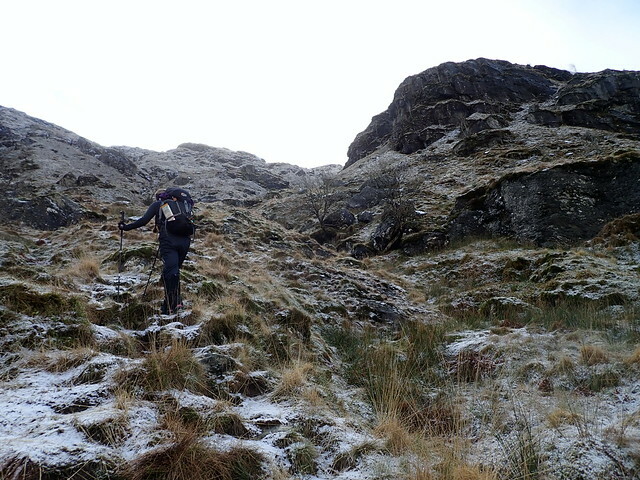 I had intended to add in a number of Simms to the route, and Allison was in agreement that we could give it a try - after all the recent sacrifice of Simm targets due to weather (and sometimes human) factors it would be good to get a wee clutch today. The first two lay east of MnF's summit on a nice looking ridge. 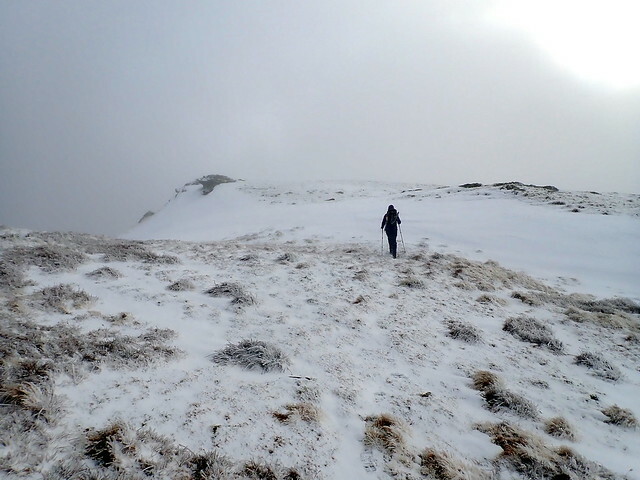 Conditions rapidly changed from blizzard to full sunshine as we wandered over. Approaching the top of the first Simm, Stob Chalum Mhic Griogair, we were obviously outwith any wind-protection from Vorlich as I actually had to crawl on hands and knees to get to the cairn. The things we do for fun It continued to be very windy all the way to the second Simm (there was a third, a good bit further away, but I didn't want to push my luck). Returning along a somewhat lower line to avoid the worst of the gale I reckoned it would be easier to head into the coire to the northeast of MnF aiming for Beinn Domhnuill rather than laboriously clamber up MnF again, so that's what we did. 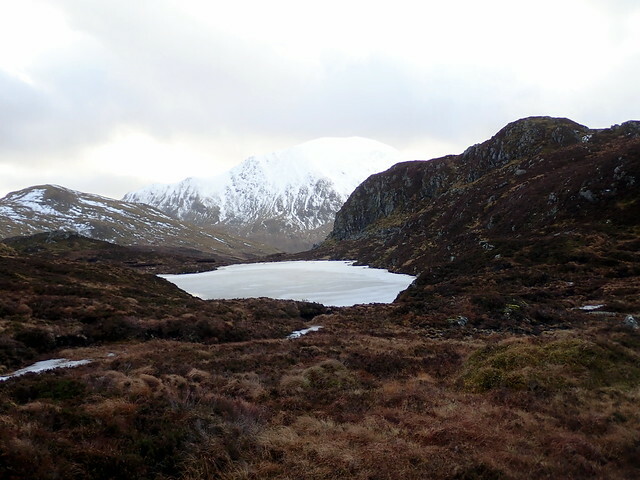 Once again blasted when we neared the summit of Domhnuill, we could see our onward target of a further 2 Simms up ahead, either side of Lochan na Mna. At least they were on the way home. 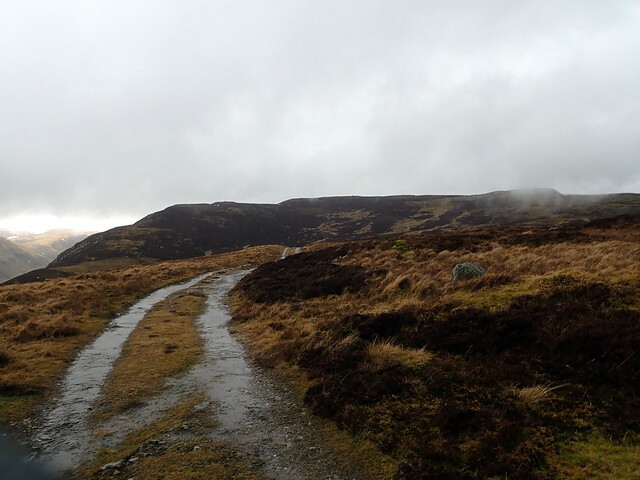 We continued down into the glen in less eventful style and regained the track. No other cars were there when we got back, battered by the wind and fairly tired. 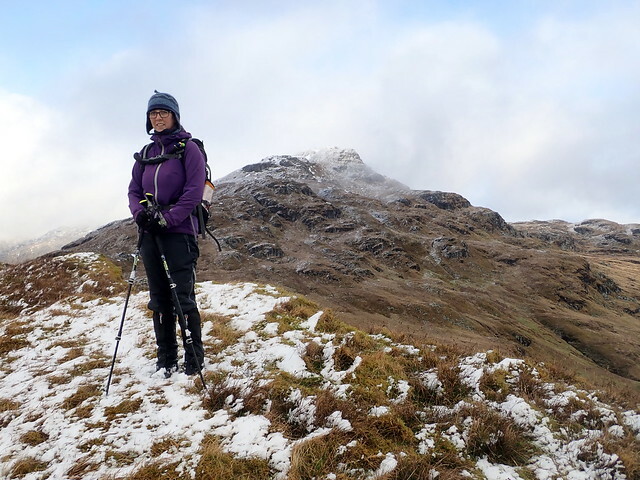 A good hat shower at Comrie eased most of the aches away. The evening was impaired by some miserable souls leaving a dog in their motor home whilst they, presumably, were at a wedding reception in the main building - the poor thing howled and yowled incessantly from 6pm til after 1am when I assume they returned (or the dog's throat wore out). Even with ear-plugs it was not possible to block the sound out. Tired, we got up and got packed - an initially sunny, but frosty morning turned to rain and overcast as we drove south. 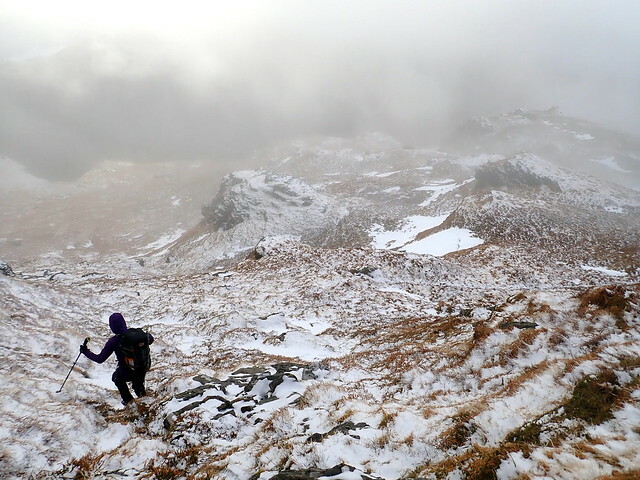 Last time we'd done The Brack was along with Ben Donich, in the middle of summer - a bit of a grueling experience. 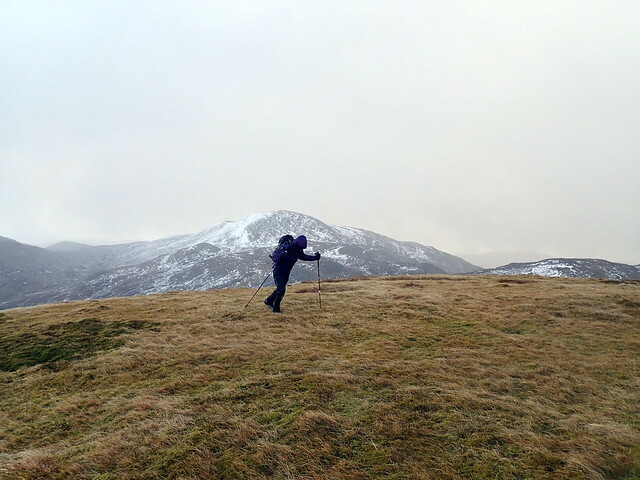 And Cnoc Coinnich had been a midweek, after work blast, soon after it had been promoted from Graham to Corbett. 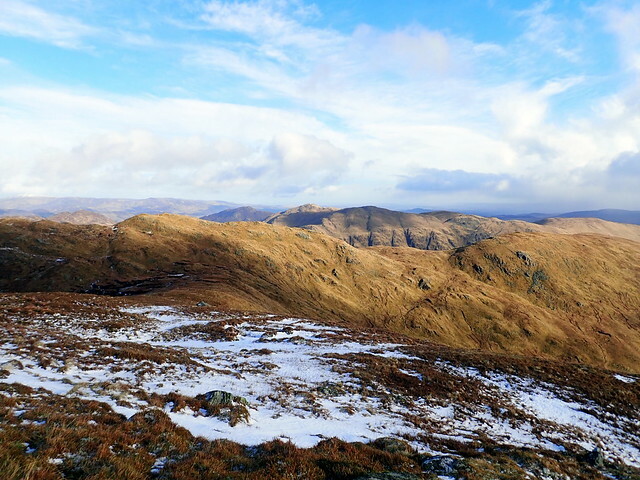 To combine the two looked eminently sensible on the map (although as I only needed Cnoc Coinnich we could have done it in a circuit from Lochgoilhead and included the Simm of Beinn Reithe). I was once again lacking in energy as we set off from Ardgarten. 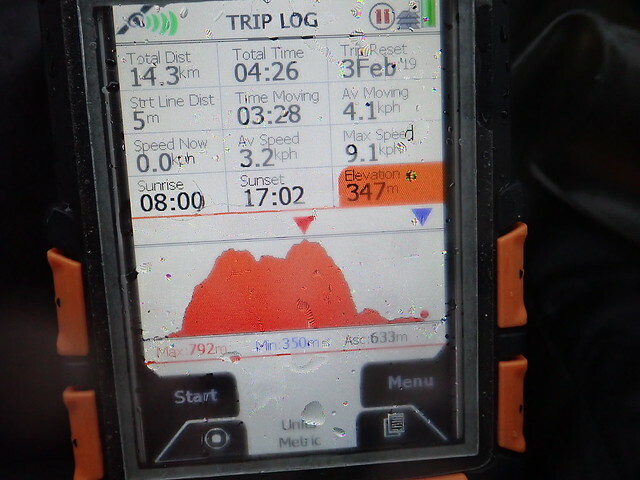 Today we were starting from 44m, rather than the 326m on Friday or the 133m yesterday, so I was feeling quite miserable about this. 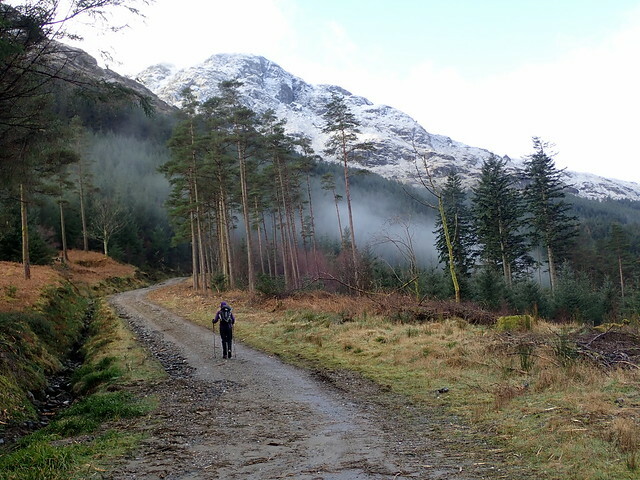 Seeing the bulk of the mountain looming overhead as we walked through the forest was not encouraging - I'd been up this way once before in poor weather so had seen very little of the terrain. A long, slow pull up the path (which is very eroded by water in places, specially at the start) - we stopped for food in the jumble of boulders before reaching the lochan. Another walker had been up before us - we met him when he was coming back down from the summit, having left us a nice footprint guide through the crags. 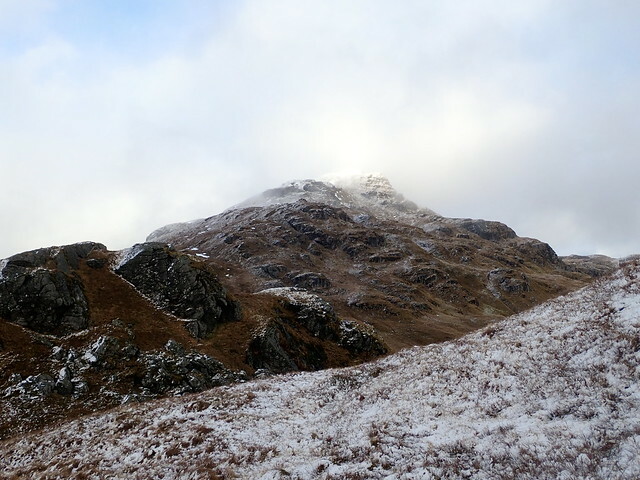 As yesterday, the sky was almost clear at times, whilst at others the clag came down reducing visibility to varying shades of white. 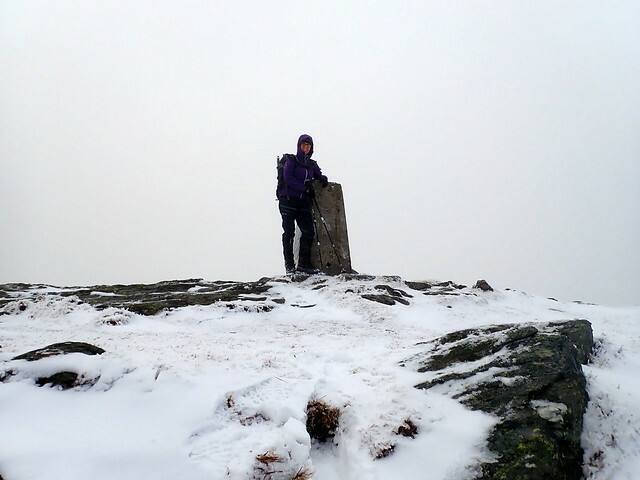 The trig point was reached- bearing taken for the route down, which has some crags to be negotiated. Further down there's a clear path however, and we romped along this heading for the obscured-by-clouds form of the Littlest Corbett. 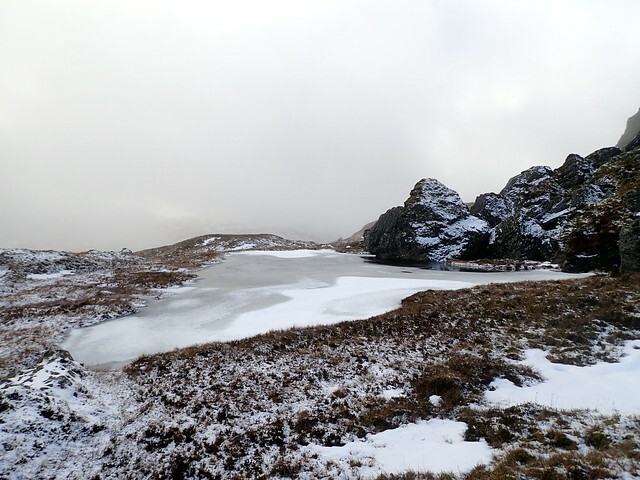 My main memory of Cnoc Coinnich was that the approach to it - along the Cowal Way - was nearly sub-aquatic. 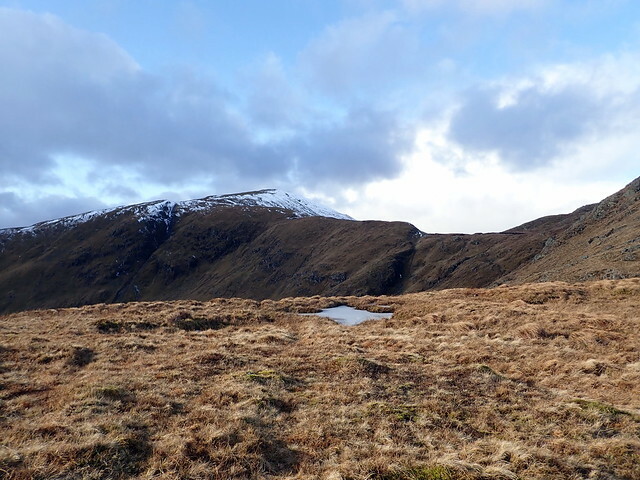 Unlike the frozen bogs and peat hags of yesterday, these bogs were fully thawed, including the hole I stepped into, inadvertently - up to the knee in icy water. 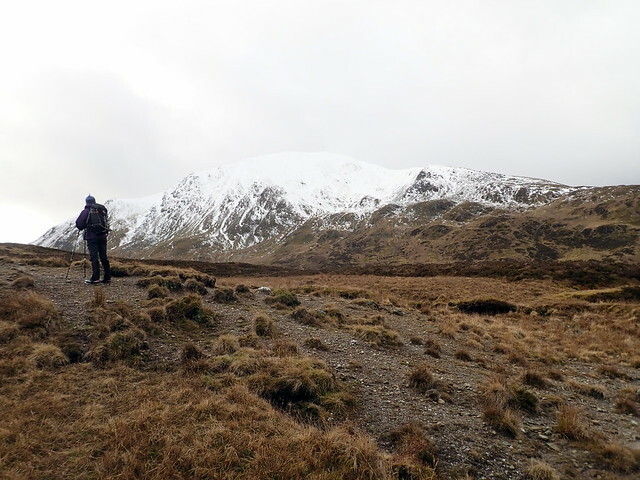 We gained the shoulder of the Cnoc and followed a faint white path uphill - didn't look like anyone else had been up today. 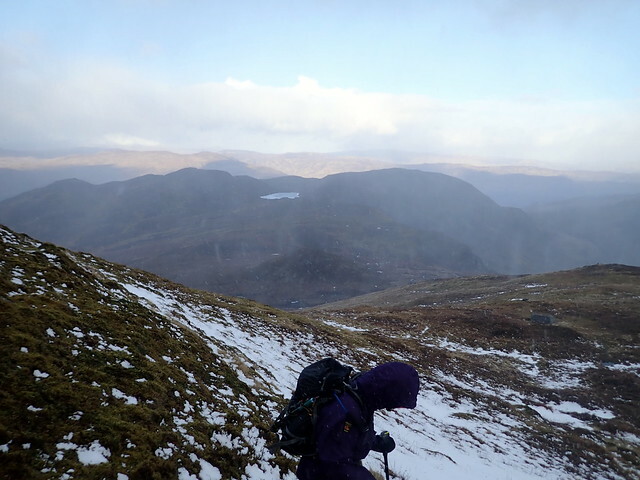 The snow came on quite heavily as we made our ascent, changing to clearer skies when we were on the way down. How often does that happen...From this aspect, the Brack is an impressive mountain, all bluffs and crags. Desreves a bit more of an explore in good visibility. We returned to the Cowal Way, following this down into the trees then a long tramp back along the metaled road back to the car park. Rain started to fall heavily after we made it into the car, for which we were grateful. Once again a weather dominated weekend, although we did manage more on Saturday than might have been the case, given the force of the winds. Last edited by weaselmaster on Mon Feb 11, 2019 10:51 pm, edited 1 time in total. Heck - that's courageous stuff! I love the "character" on display in the pics of Alison deeply engrossed in her own personal wind-battle (P2090166 and P2090174) . Generally I like to read about this kind of experience (vicarious, rather than actual damp pleasure....) . 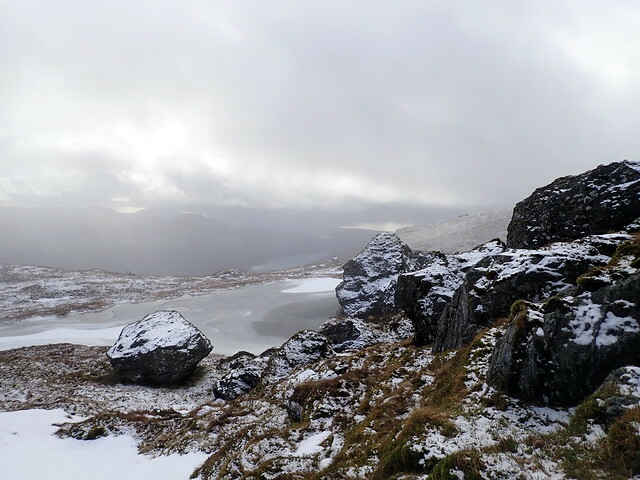 Your route up to Meall na Fearna is almost identical to one I planned, but never actually walked (being seduced into a different route by the view from the summit of Ben Vorlich of MnF all dressed in white). Great country, even when it's a tad damp.